As this blog post is being written, the Boogaloo Bag writers are listening to Downtown Soulville, the wonderful soul music radio show presented by Mr. Fine Wine each Friday night on WFMU. Although it started as a straight soul music show, it has, in recent years, opened the floor to doo wop, R&B and blues. Indeed, he just played a cool Guitar Slim track. At the moment he is playing an ultra hip song by The Miracles called “Save Me.” On his show he plays a LOT of ultra hip tracks, many of which are barely known outside the realm of hard-core soul music enthusiasts. Mr. Fine Wine’s show has been aired for over twenty years. Luckily for the world, many of his shows are archived and nearly all of them have their set lists noted at the WFMU website. Lately, Mr. Fine Wine and his lovely wife One Mint Julep have been spinning soul records together at a Brooklyn club called Friends and Lovers. It’s a good soul night, with folks dancing until dawn to the great music that these two put down. They also have a popcorn oldies night at the Robert Bar. 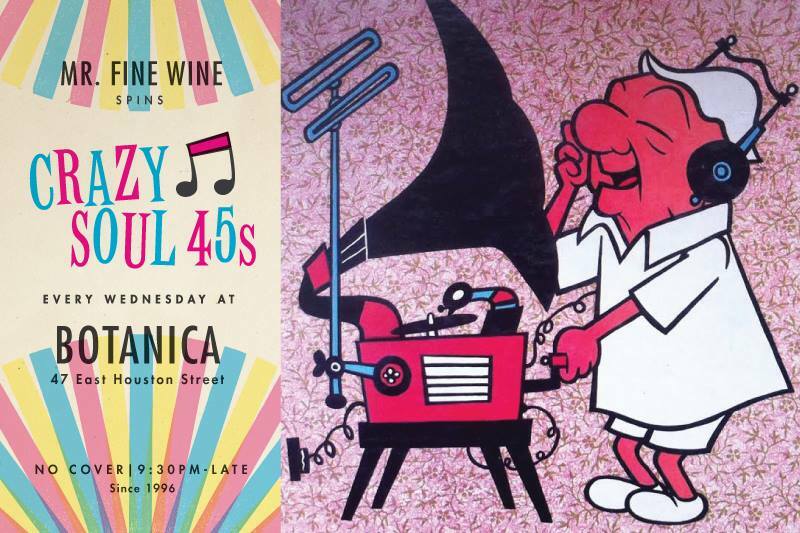 Mr. Fine Wine swings at Botanica every Wednesday night! 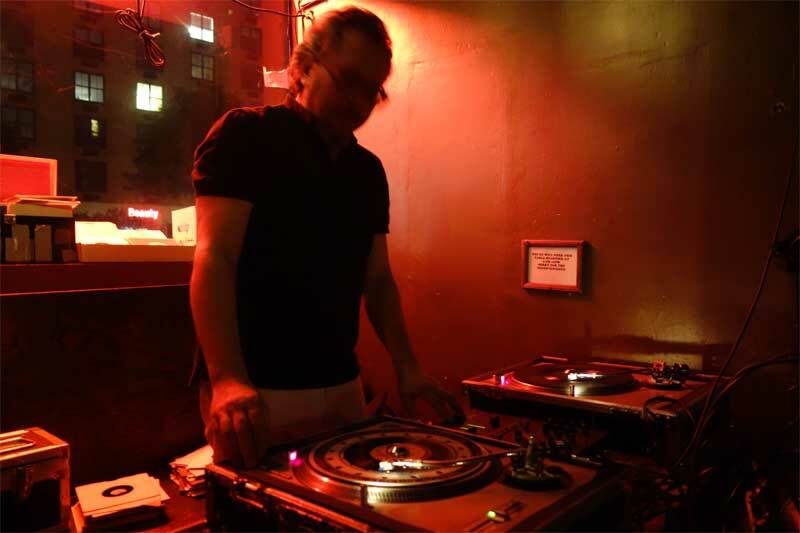 It has been noted several times in the Boogaloo Bag that Mr. Fine Wine also spins records at a cozy Manhattan club called Botanica. Phast Phreddie the Boogaloo Omnibus has DJ’d there with him on several nights, but always special event nights—ie, record release parties, anniversaries, etc. However, on the last night of August, he was asked to be Mr. Fine Wine’s sole special guest at Botanica. So, what does one play when one is in the company of such a significant presence? Any attempt to out Fine Wine Mr. Fine Wine would be embarrassing and futile. So instead, Phast Phreddie the Boogaloo Omnibus played a few records that Mr. Fine Wine may not have heard (mostly because they are of foreign origin), records that he may dig (ie., he’s a big fan of versions of “Green Onions,” thus the opener), a few weird things, and some recent acquisitions. The Boogaloo Bag writers were very happy to see several of our buddies in attendance, including Jenny Wasserman (Sweet Divines) and DJ Rata (Mambo Jambo). With Mr. Fine Wine presiding, it was a splendid night of splendid soul music, as every Wednesday night at Botanica is. 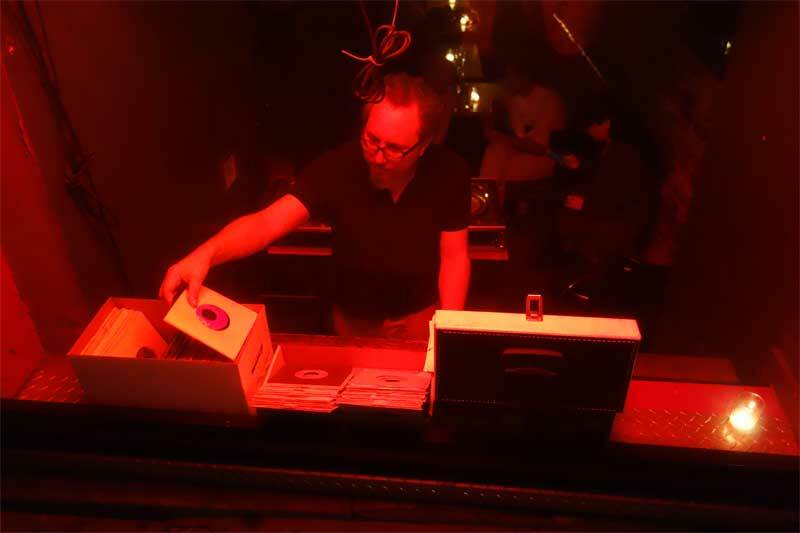 Mr. Fine Wine can be seen selecting his fine 45s from Houston Street!